KAWC, Colorado River Public Media, operates two radio stations licensed to Arizona Western College in Yuma. With studios and transmitters located on the AWC main campus in Yuma, KAWC AM-1320, now KOFA, began broadcasting on July 11, 1970. KAWC FM-88.9 was added in 1992. KAWC also broadcasts on the internet at kawc.org. KOFA AM also broadcasts on the Arizona Community Radio Network in Flagstaff, Prescott, Williams and Kingman, and online at borderradioaz.org. KAWC FM added KAWP FM in Parker, Arizona, in 2014 at 88.9 FM. KAWC provides "Trusted News for Yuma and La Paz Counties" and includes classical music and jazz. “Border Radio – KOFA” AM has a translator at 94.7 FM in Yuma, and brings together blues, folk, rock, oldies, and local artists, with community news, information about organizations and perspectives from people living on the US-Mexico Border. 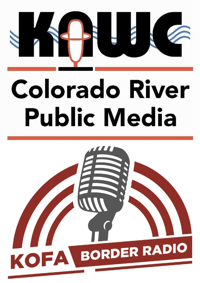 Both stations are a service of Colorado River Public Media and Arizona Western College.